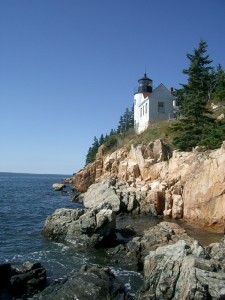 One of the most common things visitors to Freeport Maine want to do, it seems, is to visit our Maine lighthouses. We love lighthouses, so we completely understand. Nevertheless, there are over 60 of them in Maine (and some are miles out to sea), so seeing more than a few can be quite a challenge. However, our lighthouse map will help you find a way to include most Maine lighthouses on your tour. If you click on the lighthouse icons, you can get driving directions to any of the lighthouse from the Google map below. We find the most effective way to make use of your time is to establish a base of operations in an area that is centrally located to several lighthouses. That way you can visit several lighthouses without having to move yourself from place to place too often. For example, if you stay in Freeport, you can visit several lighthouses within an hour or so drive either to the north or south. A two- to four-night stay in Freeport will give you the opportunity to visit up to 13 lighthouses (and see at least three more offshore). Some of these lighthouses are in extremely picturesque locations – by their very nature, they are on high points overlooking the ocean, so these places are all great fun to visit, and to take photographs, in their own right. A hop up the coast to visit our friends in Camden, at the Inns at Blackberry Common, will give you an opportunity to see several more lighthouses in the mid-coast region (though some, like Curtis Island Lighthouse, can only be seen by air or from the water). While you’re in that area, don’t forget to stop at the Lighthouse Museum in Rockland. If you stay on, or near, Mount Desert Island (whether in Bar Harbor, or one of the other lovely villages nearby), there are wonderful lighthouse on the island, or farther north, even up to Lubec, on the Canadian border. Of course, as we’ve noted previously, you can actually make a visit to Lubec, and West Quoddy Head Lighthouse (the easternmost point in the United States) a day trip from Freeport, though it is a long day – about four hours each way. If you are interested in lighthouses, Maine is the place to visit, as there are so many lighthouses, and they are remarkably accessible. Just a slight correction, the eastern most point in the United States is in fact Attu Island in the Aleutians, Alaska. It lies on the far side of the international date line, and thus is in the eastern hemisphere.